Rather than fully mashed, smashed potatoes are left chunkier. Firmer potatoes work best for making smashed potatoes. Similar finishes can be used for smashed potatoes as with mashed, including cheese, sour cream sauces, garlic, or any seasonings you like. 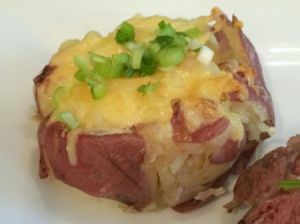 This page contains smashed potato recipes. This recipe is an easy one to prepare, is economical and the perfect partner to the Glazed Meatloaf. The two recipes go together like "Peas and Carrots" which incidentally makes a lovely side dish to be served with the Meat Loaf and Smashed Potatoes. There are no substitutions for the little new red potatoes. They have such a wonderful flavor and are full of earthy goodness. Saute onion white parts, saving the chopped green parts to add later. Saute the chopped white parts of onion only in the butter over medium-low heat. Cook the onion whites until translucent, about 5 minutes. Prepare sour cream dressing by whisking sour cream, half and half, a tsp. of salt and 1/4 tsp black pepper until smooth. Remove from heat, cover and keep warm. Smash potatoes and finish up: Drain potatoes and return to dry pot, and allow to stand for about 5 minutes. Using a rubber spatula, break apart the potatoes into large chunks. Fold in sour cream and onion mixture and mix until only small chunks of potato remain. Stir in green parts of the scallions, cover and keep warm until ready to serve. Source: This is a recipe that came from my subscription to Cooks Country magazine a good while ago. It is very good and the perfect one to serve with the Glazed Meatloaf from the same issue. I hope you enjoy them both. Editor's Note: Here is Julia's recipe for Glazed Meatloaf. Try these yummy red potatoes baked and covered with cheese. This page contains cheesy smashed potatoes recipe. I'm looking for a copycat recipe for garlic smashed potatoes from either the 99 Restaurant or Bugaboo Creek. Hopefully one of your readers will be able to help me. Thanks for a wonderful ezine!